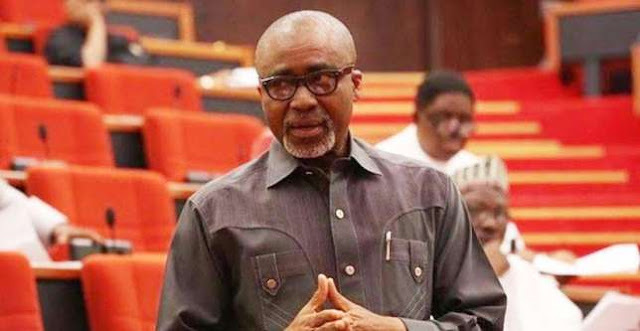 Attempting to use the issue IPOB agitation to deflect attention away from the real motive behind the public arrest of Senator Enyinnaya Abaribe is a ploy that will not wash with the public. The only plausible reason he was arrested is because of his public exposure of 30 billion Naira budget fraud perpetrated by the APC government. This remains the indisputable fact that no amount of blackmail with the name of IPOB will ever eradicate. Attempting to link Senator Abaribe to the fanciful concoction of proscribed organisation, guns and terrorism is a cheap and tacky attempt, designed to appeal to the base instinct of those core northerners opposed to the idea of self determination as championed by IPOB. Every child knows who the real terrorists are in Nigeria. They remain the fourth largest terror network in the world, responsible for large scale ethnic cleansing in the Middle Belt and beyond, they are Fulani herdsmen. Till date, no Fulani man, we repeat- not a single Fulani person has been prosecuted for sponsoring this deadly terror group. Despite the public statement by the Kaduna State governor, who by his own public admission paid killers (Fulani herdsmen) large sums of money to stop the slaughter of their fellow citizens in Southern Kaduna, nobody has been charged. It is a well known and documented fact that politicians in the East do not support IPOB or Biafra. This is well known to everyone, not hidden. How can the same politicians that despised IPOB to the point of instigating Operation Python Dance that resulted in the death of hundreds of IPOB family members suddenly turn around and start supporting IPOB in secret. Maybe it's because northern politicians sponsor Boko Haram and Fulani terror herdsmen in secret that is why the cabal thinks that it is inconceivable that IPOB can be this powerful without support from politicians. The strength of IPOB lies in the truth it preaches, it's global structure, internal discipline and the grace of God not man. If Senator Abaribe, simply by standing surety for Mazi Nnamdi Kanu stand accused of supporting IPOB, then all those that stood surety for murderers, kidnappers, rapists etc are equally guilty of the offence as charged. This move against Senator Abaribe by SSS, makes a nonsense of the Nigerian judicial process and mockery of the law. Last time we checked, it's not against the law for a senator to stand surety for an accused person. Is the government suggesting that standing surety for an individual is tantamount to supporting that person's cause? So Senator Abaribe must be released within the next 48 hours. This is not the first time the government have sought to tamper with a judicial process. Senator Abaribe is due in court on Tuesday 26 June 2018 on bond forfeiture hearing before Justice Binta Nyako, so why arrest him before his day in court? Is it because the government is seeking to protect the army, who in all probability will be found in contempt of court, for invading the home of Mazi Nnamdi Kanu on September 14, 2017 with lethal force? Weeks before his court appearance in court in Abuja. These are well digested facts in public domain, supported by video evidence. No amount of intimidation by SSS can sweep this incriminating fact under the carpet. Our leader have always said that every South East and South South politician serving Nigeria will return home in shame unless they turn around now and start campaigning for self determination. We are certain that if not for the immunity conferred on his office, Gov. Nyesom Wike by now will be in detention answering to one frivolous charge or the other. Only Fulani lick-spittle like Dave Umahi, Okezie Ikpeazu, Willie Obiano and a plethora of other political slaves are spared the humiliating treatment of publicised public arrest because they are obedient to the master. Like every other Jihadi Islamic fundamentalist regime in the world that got into office via the ballot box, this APC regime will ultimately succeed in stifling democracy, criticism, opposition and dissent. Egypt under Morsi is a fine example. Nigeria have succeeded in descending into brutal totalitarianism under 'Buhari' and if Senator Abaribe is not released before 6pm tomorrow Monday the 25th, IPOB will call for a day of rage against the fascist government of Nigeria and her agents in the South East and South South. Let Britain and the rest of the civilised world not say they were not warned.